Our dedicated media sister site has a dedicated section for all the best before, during & after online content from this years Festival. 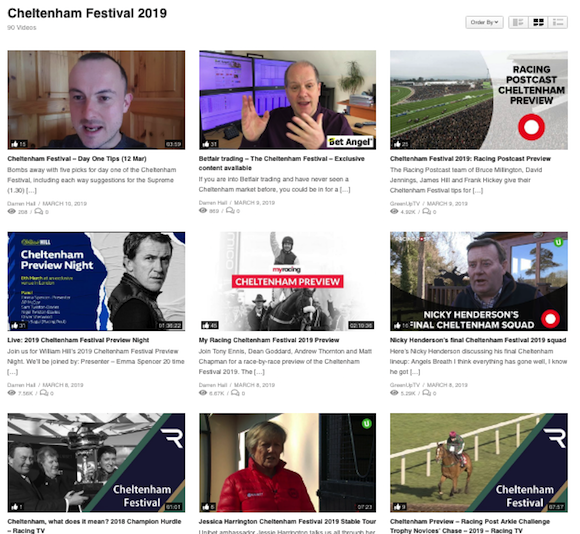 You will not find a better selection of Cheltenham content anywhere. Here’s a selection of the latest content from the site…. #Digitex #DGTX #DigitexFutures Adam Todd, CEO of Digitex Futures takes a quick tour of the Digitex Futures platform prior to […] The post Digitex Exchange pre-launch, first look! appeared first on GreenUpTV. How do YOU deal with trading stress? This weeks Q & A discusses a common problem… SUBSCRIBE here: https://goo.gl/aKqhyb to […] The post How to Deal With Trading Stress! (Q&A Help) appeared first on GreenUpTV. When you’re looking at trading on Betfair on horse racing. It’s important to look at seasonality, but also underlying form. 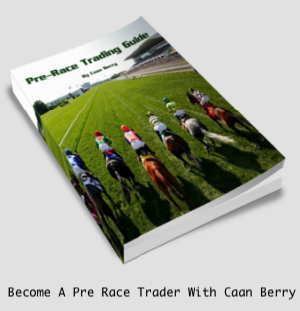 […] The post Betfair trading – Using form lines to help your trades on Horse Racing appeared first on GreenUpTV. SUBSCRIBE: https://goo.gl/aKqhyb to get updates when I post a new video! IN THIS VIDEO: In this followers Q & A […] The post WHEN to Change Trading Tactics: appeared first on GreenUpTV. Follow us on social media yo learn and earn using our tools from http://www.inplaytrading.com. Telegram service coming soon, email iansportstrader@gmail.com […] The post Free Tips and Advice on the Inplay football markets courtesy of the Inplay Scanner tool. appeared first on GreenUpTV. It’s the first Golf Major of the year, the US Masters as Augusta. I’ve done a quick video here to […] The post Golf Betting Tips – My TOP 5 for the US Masters appeared first on GreenUpTV. In this weeks Betfair Trading Community Sports Trading Show, we have an action packed of sports trading to cover from […] The post The BTC Sports Trading Show – Week17 appeared first on GreenUpTV. If you are looking for one of the most PROFITABLE strategies for trading football on Betfair then the approach of […] The post Football Trading Strategy – Lay The Winning Team And PROFIT! ️⚽️ appeared first on GreenUpTV. Learning to trade? You’ll need to know the basics, be it the differences between Betfair’s Exchange and Sportsbook or more […] The post Betfair Introduction: Exchange v Sportsbook (Video Course) appeared first on GreenUpTV. Every time a big betting event occurs I’m reminded of that fact that while people like to have a bet […] The post Betting strategy tips – How bookies make money from sports betting appeared first on GreenUpTV. The highlights from a day when Tiger Roll emulated the great Red Rum by winning back to back Grand Nationals. […] The post Grand National Day 2019: Highlights appeared first on GreenUpTV. Tiger Roll makes history becoming the first horse since the mighty Red Rum to win back to back Grand Nationals. […] The post The 2019 Randox Health Grand National – Racing TV appeared first on GreenUpTV. Join Thom Malone David Jennings, Johnny Ward and Declan Marron from Ladbrokes as they Preview the weekends racing. After having […] The post What’s The Word? Weekend Racing Preview appeared first on GreenUpTV. After a day of colourful fashion and some superb performances on the track, juxtaposed with the sad loss of two […] The post Postscript: Lee Mottershead analyses the action from Grand National Friday 2019 appeared first on GreenUpTV. Dave Orton with three selections from Grand National day. — Subscribe on YouTube: https://bit.ly/2l9x35T Website: http://www.racingpost.com Twitter: http://twitter.com/RacingPost & http://twitter.com/RacingPostTV […] The post Ten Second Tips: Saturday 6th April 2019 – Racing at Aintree appeared first on GreenUpTV. Grab a drink, settle back and click. Click for a feast of the latest and greatest bookmaker, trading and general profitable videos and broadcasts available on the planet today. Our new sister site to bet72 features all the best online media content from all the leading internet money makers. At the time of typing, our library has grown to over 1000 strong and is updated daily featuring a massive range of premium content from all of today’s leading profitable online sites & services. So whether it’s bookmakers, professional traders, automated bots, profitable systems and strategies or even a good documentary, there is something for everyone. Join our mailing list over there and you can pick up a copy of our most successful football trading strategy and 3 (yes 1-2-3) of our premium videos to help get you started, all for, you guessed it, free! So don’t delay, get over to www.bettingsystemnotes.com and grab those 3 / Three / Freebies! We have gathered together some of the best Euro 2012 videos from around the t’internet to bring you a mix of predictions, news, views and the odd tip too. We will be adding to these throughout the tournament so keep checking back. Dave Farrar is joined by Michael Cox of Zonal Marking, Duncan Alexander of Opta and resident trader Alan Thompson, to discuss and analyse the markets on Betfair to ensure you Don’t Settle For Less! In the first of a new series aimed at providing you with all the insight and statistics you need to win on Betfair. Michael Cox of Zonal Marking, Duncan Alexander of Opta and Alan Thompson our resident Betfair trader look for the value in Group A. Our panel of experts discuss who they think will make it out of Group B, and then try and find some value bets on the exchange. Our panel of experts turn their attentions to finding the value in Group C.
In the last of our Group stage videos, our panel of experts discuss all things England as they (struggle to) make a case for the Three Lions to progress! Racing Post’s sports betting experts Ian Wilkerson, Mark Langdon & James Milton look ahead to Euro 2012. The Racing Post pundits come up with some big-priced contenders to be the tournament top-scorer. The Racing Post’s sports betting team look ahead to Euro 2012 and come up with the best bets for the group stage of the tournament. Who will finish bottom of Group B? Who will referee the final? The Racing Post’s sports betting experts come up with the best value special bets for Euro 2012. Here at Sports Tonight we’re all extremely excited for Euro 2012 and our resident betting expert Chris Graham joined Ian Payne, Perry Groves and Mick Dennis to discuss some of the best bets ahead of the tournament. Here’s all the latest Euro 2012 news from the truly wonderful 101GreatGoals website, just take your pick from the recent headlines below…. I hope by now you have had chance to take a look at the wonderful Betting System Notes software and seen how we really profited from the strategies over the football season so far. No!!! Are you mad????? Please then click here immediately. Well the boys behind the strategies (Adster and Bingo from Trading Football) have given everyone a really festive treat with their entire (yes a full 30) premium trading library available for just £49 (that is not a misprint, £49) PLUS a extra BONUS of 3 Scalping videos too! Not sure how long this offer is on for but I wouldn’t hang about on this one if I was you. Look….. Developing strategies and techniques for trading football on the exchanges are the bedrock upon which we base our training services here at Trading Football. Match selection criteria are aligned with an appropriate strategy for the basis of a given trade. So now we are making available all our 30 videos at a special knockdown price of £49! This means you can prepare yourselves for your trading journey by studying and learning the highly successful strategies we have been employing over the past 3 years. That`s right. The starter / Intermediate / Advanced pack of tutorials: all 30 of them for just £49. And to help make your mind up a little futher then the boys have added a preview of the entire video set. This should really give you a feel of the power of the ideas on offer and what better time to get more acquainted with them than now, with football now on every day of the week and there are £’s, £’s, £’s to be made…..
To find out more about the boys themselves just click below…..
And don’t forget to find out more about the Betting System Notes software and to grab some extra special bonuses too then just click here. I hope by now you have had chance to take a look at the wonderful Betting System Notes software and seen how we really profited from the strategies over the new football season. No, are you mad, click here immediately. Well now we have a little extra for you too, preview videos of a few of the strategies in action. This should really give you a feel of the power of the ideas on offer and what better time to get more acquainted with them than now, as the footy is in full swing and there are £’s, £’s, £’s to be made…..
adster aperitif-preview from Nugget Crew on Vimeo. Bingo`s Bistrot – preview from Nugget Crew on Vimeo. CoverS Part 1 – preview from Nugget Crew on Vimeo. CoverS part 2 – preview from Nugget Crew on Vimeo. Nugget Nibble_preview from Nugget Crew on Vimeo. xt starter preview from Nugget Crew on Vimeo. To find out more about the Betting System Notes software and to grab some extra special bonuses too then just click here. First shown on Spanish TV labelled “Coro futbolístico” – “Chorus Football,” where someone who clearly has far too much time on his hands has put together some of the world’s leading footballers singing the highlight of Whoopi Goldberg’s classic movie Sister Act – “I Will Follow Him”. Just look at the cast list, Romário, George Weah, Zidane, Luís Figo, David Beckham, Cristiano Ronaldo, Roberto Carlos, Thierry Henry, Maradona, Cannavaro, Ronaldinho, Lionel Messi, Rivaldo, kaká, Roberto Baggio, Lula, Felipão (Big Phil), Jô Soares (viva o Gordo), Zagallo, Pelé, Berlusconi….. Missed the Champions League Final last night or just want to see the action again then we have the final condensed to less than 10 minutes…. The Didier Drogba “f****** disgrace” video, a classic remix of the Ivorian’s potty-mouthed outburst hip-hop style, also featuring Ruud Gullit and Richard Keys. Parental advisory naturally. 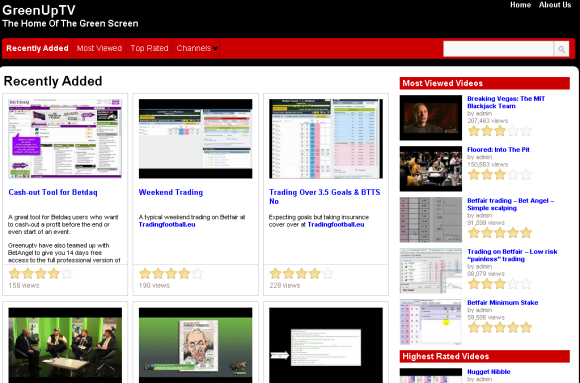 Adam Todd, Betfair Trader extrodiaire, has just launched the Racing Traders You Tube Channel, where some his “marvellous” videos are now showcased for the world to see, well worth a watch.